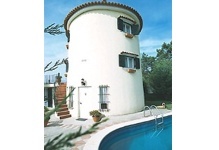 These two windmills have been restored to the highest standard to give unusual 3 bedroomed accommodation with two swimming pools. The tower of the mill has been converted to provide two bedrooms each with a double bed and an en-suite shower room. Access is by a spiral staircase outside the room. The ground floor of the mill is now the entrance hall with the staircase going to the bedrooms above. A sofa bed in the entrance hall provides an additional bed for one adult or two children. Walking through the entrance hall brings you to the former mill store which has been converted into a large living room. This room has a sitting area and a dining area and is separated by a partition from a fully equipped kitchen. Leading off the sitting room is a bedroom with a double bed and a shower room adjacent. The small walled garden has a barbecue area and a small oval swimming pool in which you can swim against a current provided by underwater jets. The oval swimming pool is 7 metres by 3.5 metres and the depth is a constant 1.2 metres. Steps lead up from the garden to a raised sun terrace. Outside is one of the small differences between these two mills. In one the outside table is in the shade of a small tree, while the other mill has a linen canopy to provide the shade. These windmills were built on a ridge to benefit from the 'Portuguese Trade Winds' which blow from the north almost every afternoon in summer. Nowadays these winds no longer power these mills but yachtsmen from northern Europe still use them on their journey to north America. This is of great benefit to the holiday maker providing cooling breezes preventing the high afternoon temperatures of the rest of Iberia. The mills are 6 kilometres by car from the long sandy Atlantic beaches at Apulia - also well known for small beach side restaurants where the fresh fish caught by the fishermen is barbecued. The UNESCO World Heritage City of Porto is about 30 minutes away by motorway. The village is part of Barcelos district where the Thursday market is reputed to be the largest in Europe. Also within easy reach by car are Braga, the religious capital of Portugal, Guimarães the former capital of the country when Lisbon was conquered by the Moors. To the north is the old sailing city of Viana do Castelo. To see the unspoilt way of agricultural life a journey should be made into the National Park of Peneda-Geres.